A Cosmic Alignment Spells Doom! The approaching alignment of the planets threatens to end all life on Earth. Ancient prophets knew this day would come, and built massive stone monuments that conceal the keys to survival. 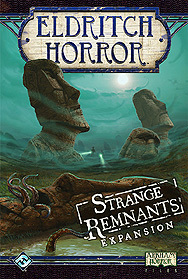 Can you uncover the secrets of these ancient ruins and survive the horrors that lurk within? This expansion features a new Ancient One, and new encounters, Adventure cards, and Prelude cards. Four more investigators enter the game, along with Artifacts, Assets, Spells, and Unique Assets to aid them in their struggle to save the world.